Some yum yums to share! So I figured out how to post on this blog, using my own name and profile. If you look at the bottom of this post it says…written by Lauren Demby! YAY! Anyway, I have done a bit of cooking as of late, and have even had a guest over to eat some of the food! My good friend and roommate from my senior year at Pitt, stopped by for some tasty treats! 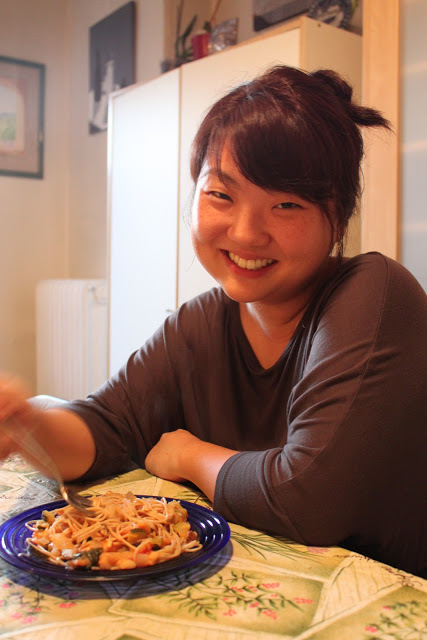 We cooked a delicious meal together, which was very similar to my recipe from Dinner (DAY 1: Vegan, Wheat-Free Diet). As seen in the picture below, we ladled the sauce over some whole wheat pasta, and added a sprinkle of cheese on top. Now I know what you are thinking. Shame on me for eating wheat and dairy. 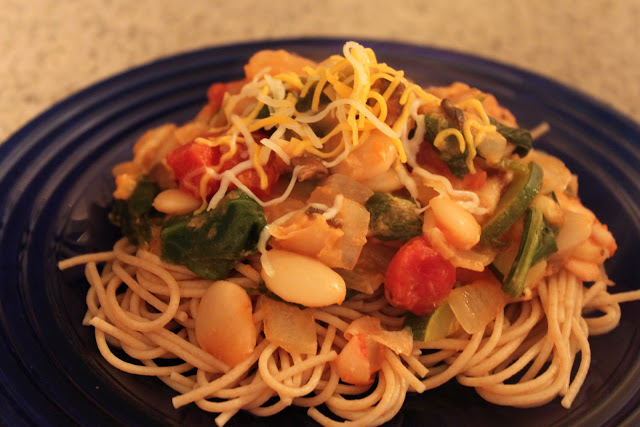 However, the amount of pasta that I ate in proportion to the veggies I slathered on top, was very minimal. I felt alright after eating the pasta, and I barely added any cheese. I was just craving some cheese, and I wasn’t going to deny myself any. I was alright after dinner, my stomach wasn’t to upset with me, however, I also watched how much of the cheese I used, which was super hard, because it tasted so good!! Ahra enjoying our tasty meal! My mother and I have also been on this Indian food kick lately. I have been craving the stuff ever since we made the Thai Chickpeas a little while ago. Indian food is so tasty and has a ton of flavor. 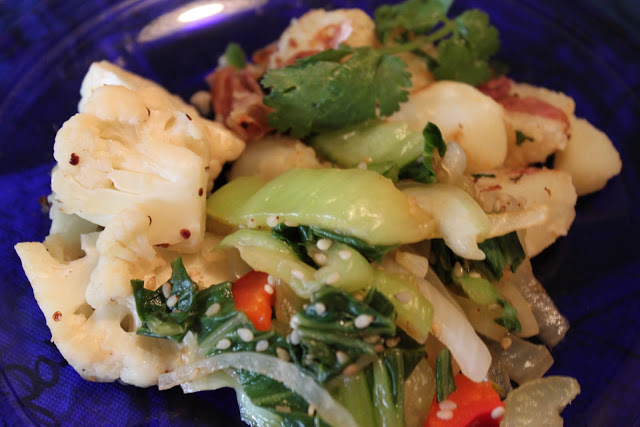 Instead of the chickpeas we made several dishes which included, potatoes, cauliflower, and bok choy. This recipe is a variation of the original from Madhur Jaffrey’s book Simple Indian Cookery. This recipe is a variation of the original from Madhur Jaffrey’s book Quick and Easy Indian Cooking. We also recently celebrated my Dad’s Birthday! Happy Birthday Daddy! 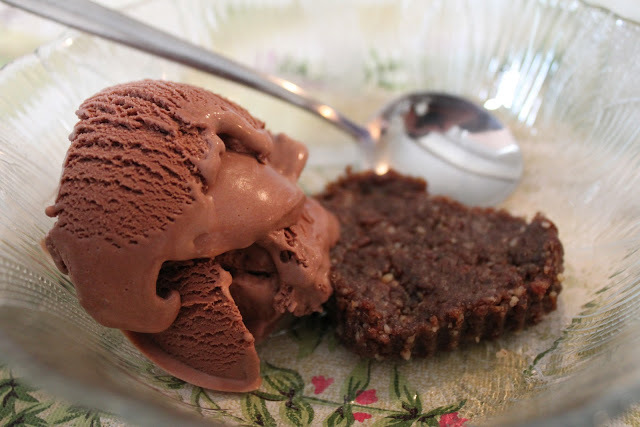 For a healthy alternative to birthday cake, my Mom made some yummy date treats, which we topped with the chocolate version of my favorite coconut ice cream!